For this hop we will be featuring the letter N. This may be the name of a paper, a stamp set or an embellishment. 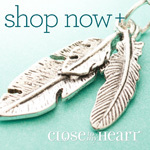 Whatever the crafter has chosen as their M element will be featured in their post. If you have just hopped onto my blog, please start at the beginning at Linda’s blog ~ Scrappy Therapy. If you’re coming from >>> you’re on the right path. My “N” is two fold…a neutral card using the Newlyweds stamp. 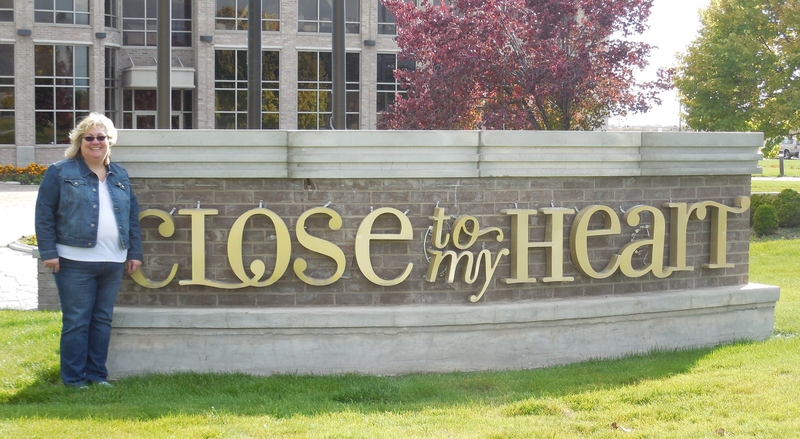 I love Close to My Heart’s Embossing Folders the Damask Embossing Folder leaves such a nice clean, deep impression. I especially love using it on our white daisy cardstock for it’s elegant look. I wanted a simple and elegant look for this wedding card so I kept with a neutral palette of black & white. 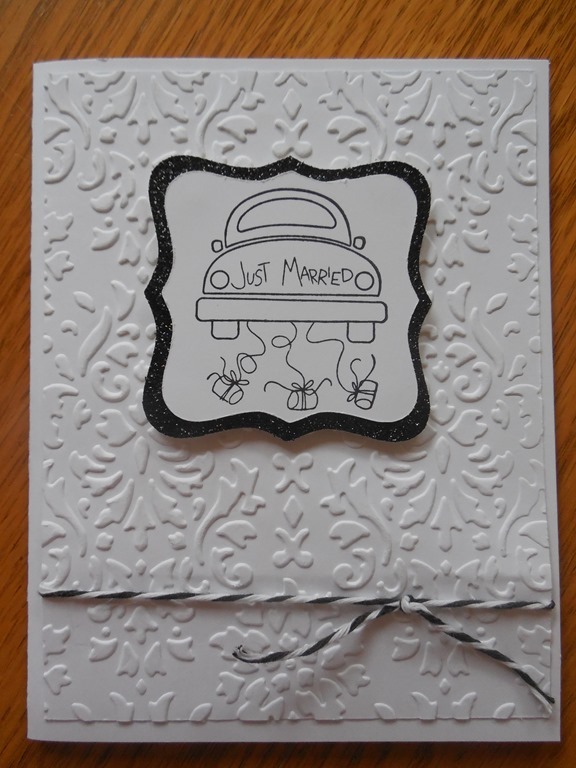 The card front is tied with a piece of black Baker’s Twine and the Newlywed car is mounted on 2 inch square cut from the Art Philosophy cartridge, the square is then cut again at 2 1/4 from Black Glitter Paper. I know I’ve mentioned that I love our Glitter Paper because it doesn’t “shed” and works slick as a whistle in the Cricut. 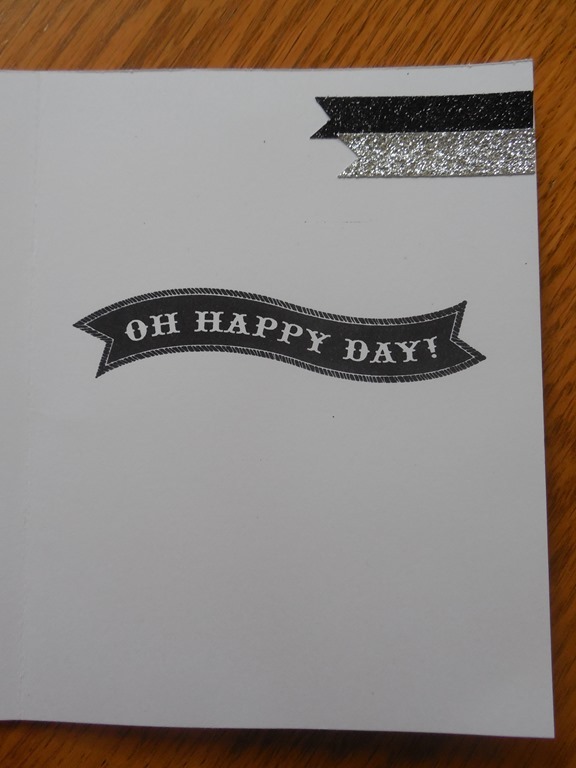 As you know I think it’s just as important to decorate the inside of the card so after stamping “Oh Happy Day” from the Artiste Collection Bundle I topped it off with silver and black Shimmer Trim. I hope you’ll hop on over to Catherine’s Catscrapbooking where you’ll discover her use of the letter N.
I really like the clean look of your card! Very Nice!!!! thanks Renee….I love color, but had recently seen a card that used all white and I loved it. Your card is beautiful! The white really is so clean and crisp. I really like it a lot! Gorgeous embossing- such an elegant wedding card.